In a lot of ways, Redshift’s The Quest ($4.99) is one of the best mobile RPGs. Its huge open world is a great place to lose hours in, but its quest-based structure makes it equally suitable for shorter play sessions. You can enjoy it as a straightforward hack ‘n’ zap, skipping around from dungeon to dungeon smashing the monsters that get in your way, or you can dig in deeper, building crafting and alchemy skills, collecting flowers for recipes, reading books, and so on. Still, most games like this have an end, and when you run out of things to do, that’s usually that. In the case of The Quest, however, a massive amount of content has been added through expansion packs, most of which have been handled by third-party developer Zarista Games. Their latest effort is Cursed Stone ($2.99), an adventure that sees you trying to save a small fishing town by restoring the magical stone that brings them luck. 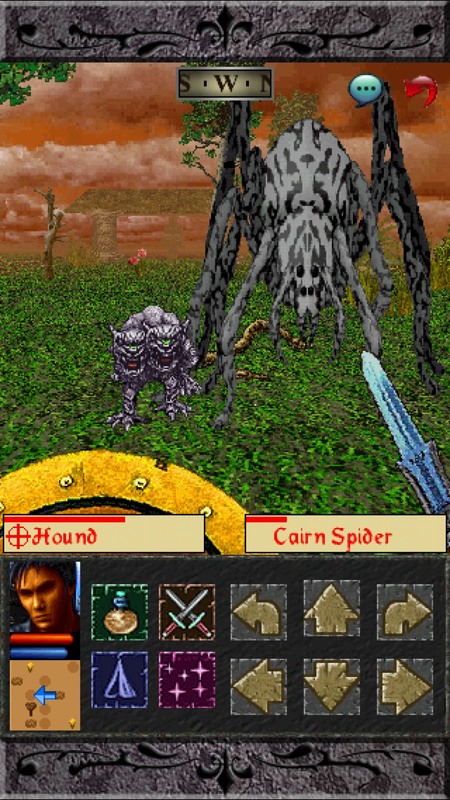 As usual for an expansion to The Quest, Cursed Stone is available as a stand-alone app. 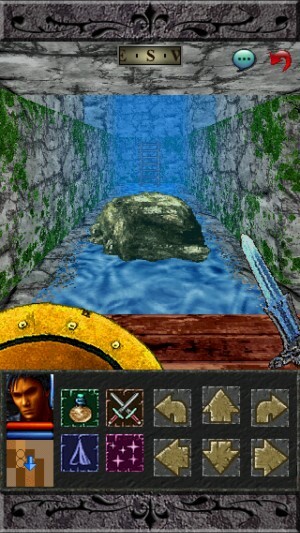 If you already own The Quest, a tap of a button on the main menu of Cursed Stone will enable the expansion in that game, allowing you to delete the separate app if you like. You’ll have to do the usual routine of talking to the Captain at Matras Harbor. He’ll ferry you to the island where Cursed Stone takes place. If you don’t already own The Quest, you can play Cursed Stone as a separate game just fine. The game will generate an appropriately-leveled and well-equipped character for you and drop you right into the expansion area. Either way, Cursed Stone is best enjoyed with a level 16 character. Too low, and you’ll have trouble with monsters right out of the gate. Too high, and you’ll just stomp your way through everything. Unless you’ve got a character at exactly the right point, it’s not the worst idea to just let it generate one for you. 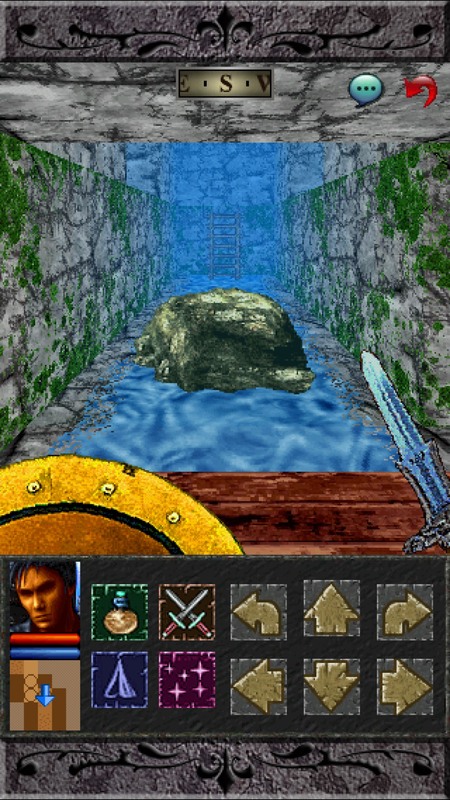 I’ve done a fairly extensive write-up on The Quest in one of my early RPG Reload columns here at TouchArcade, but I don’t think we’ve ever talked much about Zarista’s expansions on the site. It’s interesting to see how their design philosophy differs from that of Redshift, who did the original game and the first expansion. Cursed Stone, like Zarista’s other releases, isn’t terribly concerned with maintaining the illusion that the game world is a real place. There are a lot more in-jokes, contemporary references, and flirtations with breaking the fourth wall. Treasure and loot is strewn about willy-nilly, making it hard to take even a short walk without stumbling on some new piece of gear. The puzzles aren’t concerned too much with justifying why they’re there, apart from the fact that this is a game and puzzles are fun to solve. Zarista also likes to pile up quests on the player with wild abandon. You’ll leave the town that you start in stuffed with cool weapons, items, spells, and so on, and a quest log full of things to do. It’s practically outright telling the player that it knows why we’re here, slinging one saucy meatball of adventure after another onto our plates before sending us on our way. I could see this approach bewildering new players, because there really is an awful lot to process initially, and the game fully expects you to already know its basic rules and rhythms. You don’t have to have played any of the previous expansions to jump in here, since Cursed Stone has its own story, but I’d recommend spending a little time with The Quest‘s core adventure to learn the ropes. If you’re already familair with the game or any of its expansions, though, I suspect you won’t mind that Cursed Stone is more concerned with providing fun than trying to explain why there’s an awesome axe just laying in the middle of the field outside of a fishing village. That’s not to say there aren’t any decent stories to be had here, mind you. One of the stronger qualities I’ve seen in most of Zarista’s work is in its often-curt dialogue that manages to deliver some solid impact even at its shortest. It’s not the sort of narrative that’s liable to stick with you after you’ve finished the game or anything, but in the moment, it’s interesting enough to pay attention to. Another interesting element I’ve noticed in Zarista’s games is a fascination with Celtic mythology. Cursed Stone is no different in that regard, as it seemingly draws a great deal from the local legends and superstitions of the Isle of Skye in Northern Scotland. Basing it on a real place lends a bit of authenticity to the game’s culture, and it’s always enjoyable to see this kind of cohesive, unique flavor in an RPG. I’ll grant that I’m not familiar enough with all of that part of the world’s lore to say how closely all of the quests tie into that theme, but it at least feels like it hangs together within the game. I get the feeling that Zarista won’t let anything come between them and a neat gameplay idea, so they must really hold this setting in a fair bit of reverence to have it stick together as well as it does. Of course, this is still The Quest, so it eventually all comes back to questing and exploring. You’ll likely stumble on the first of many dungeons before you even leave the first town. Head in any direction and you’ll certainly find more, along with other NPCs and plenty of interesting structures. As usual for The Quest, individual dungeons aren’t terribly big, but many of them require you to solve puzzles or at least think carefully about where you’re walking in order to proceed. Naturally, there are no shortages of monsters both in the dungeons and out of them, and although most of them will be quite familiar to veteran players, there are a few surprises to be found in the line-up. That’s largely who this expansion feels designed for, in spite of its low level requirements. It not only assumes familiarity with the play mechanics, but also with the general flow of The Quest‘s style of progression. The adventure itself is self-contained, but if you don’t already know the tune it’s humming, you’ll have a really hard time getting along with the beat. There’s only so much you can do with an expansion, after all. Since it’s simply a new pack of content for The Quest, you can expect it to have many of the same strengths and weaknesses in common. While the visuals are fairly dated by this point, what’s here looks as great as it’s going to on any size of iPhone screen, whether you’re playing in portrait or landscape orientation. It’s not a universal app, however, so if you’re playing on an iPad, you’ll have to make do with a zoomed view. Some elements of the UI could use some sprucing up, too. But in spite of the age of the engine, it’s been well-maintained and it works as it should. As for the content in Cursed Stone, it’s probably not shocking to say that there aren’t any surprises here. Some of the quests are a bit hard to figure out, others require you to have hung onto some item or another that you may have sold, and too many of them involve fetching X things and bringing them back. When you’ve got this many quests in a game, though, that’s bound to happen. Just as many of the quests land the way they should, providing excitement, a little brain-teasing, and satisfying rewards that fuel you onward to the next slice of enjoyment. It could probably use a little bit more in the way of guidance early on just to get people going in directions that won’t get them killed, but on the whole, it’s probably one of the better expansions Zarista has released. There was a pretty big gap between this expansion and the last one, and the sense of weariness that was starting to seep into those last couple of releases has been shaken off in Cursed Stone. It feels like the team was excited to work on this series again. 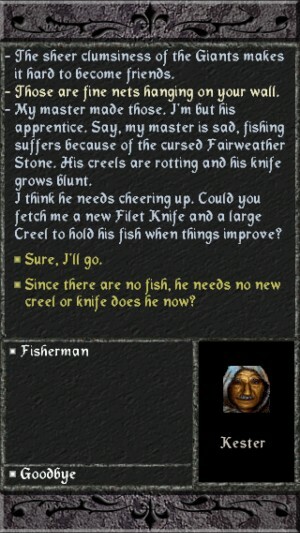 If you’re a member of The Quest faithful and don’t mind that it’s lower-level content, you probably don’t even need me to tell you to buy Cursed Stone. It’s not going to smash your conceptions of the series, but after a long break, it’s nice to have an excuse to go adventuring in this engine again. If you’re new to the series, I’d strongly recommend checking out the original game first. If you stick with it long enough to get a character up to the appropriate level for Cursed Stone, you’ll appreciate this expansion all the more. I’m glad Zarista Games is back at it again, and after sinking a couple dozen hours into this game, I’m looking forward to their next planned expansions all the more.